There are four components to a well-rounded exercise routine: cardiovascular, flexibility, neuromotor and strength. Today, we’ll focus on how strength training can help you. When performed correctly, strength training has numerous health and fitness benefits. This type of exercise contributes to a higher metabolism, builds muscle and bone strength, and increases mobility. 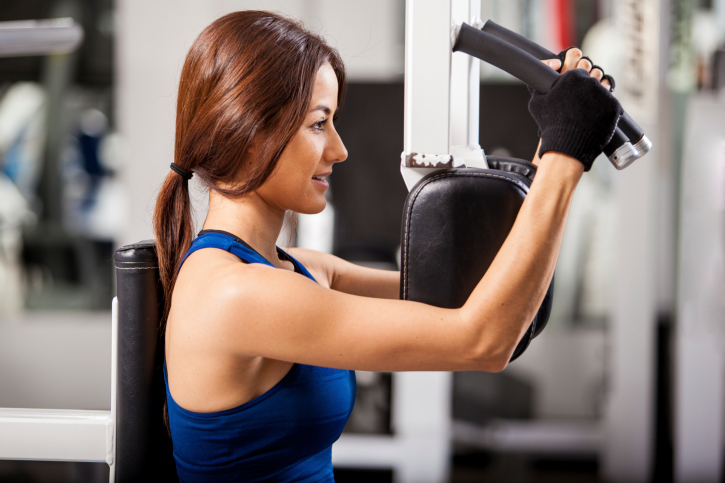 Strength training can be performed with or without weights and machines. The three categories of strength training are free-weight, machine-based and body weight. Free-weight exercises may require hand weights, dumbbells, medicine balls, resistance bands or household items such as soup cans and water jugs or bottles. Machine-based exercises utilize gym equipment, and body weight exercises only require resistance from your own weight. Thinking about adding strength training into your workout? Follow these tips to help you get the most from your exercise. First and foremost, talk to your doctor. Prior to beginning any exercise routine, you need to determine if exercise is safe for you to start and if there are any limitations you should keep in mind. Plan ahead. Consider your options and determine which exercises would be best for you. If you are looking to exercise at home, purchase the weights you will need or find household items that can act as weights. If you plan to use machines at a gym, speak with a trainer to learn how to use the equipment and exercises that can be performed on them. Planning to use your own body weight? Review exercises that you feel are within your range of capability and make sure you have enough space in which to perform them. Choose exercises you will enjoy. This will help to ensure you stick with the exercise! Learn the exercise. User error contributes to accidents, so take the time to learn and understand the fundamentals of the exercise to perform it correctly. Warm-up. Start with 5 to 10 minutes of light cardio such as walking or jogging, followed by stretching. Take your time. Getting started with strength training requires patience. Start slowly and build yourself up to prevent accident or injury. Using lighter weights to start will not hinder progress and is strongly recommended. Maintain a fixed weight for the first three weeks. For the first week, start with one set of 12 to 15 repetitions. For the second week, add another set and aim for three sets during the third week. If you feel comfortable after at the end of the three weeks, consider adding additional weight. If you decide to add more weight, work your way back up with the same one set, two set, three set process. Rest between sets. When you are up to multiple sets, take the time to rest. Rest for 1 to 2 minutes for light weights, 2 to 3 minutes for moderate weights and 3 or more minutes for heavier weights. Consider frequency. The American College of Sports Medicine recommends exercising each major muscle group two to three days per week with at least 48 hours between strength training sessions. Following this guideline is critical to injury prevention and reduces the chance of overworking muscles. Major muscles are those found in your arms (biceps and triceps), shoulders (deltoids, trapezius and latissimus), core (abdominals and gluteals), and legs (quadriceps and hamstrings). Cool down. After completing your set(s), perform light cardio for 5 to 10 minutes, followed by stretching. Check out these links for exercise ideas! Unsure of what exercises are right for you? If you are a Health Advocate member with access to our Wellness Coaching program, connect with a Wellness Coach for additional strength training tips and exercise ideas.